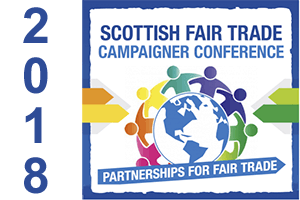 This year’s Scottish Fair Trade Campaigner Conference and AGM will take place on Saturday 8 September 2018 at Gracefield Arts Centre in Dumfries. As usual, our AGM will take place alongside. This year’s conference will focus on partnerships for Fair Trade. Check out the draft programme here. Due to venue size, there is a limit on the number of people that can attend. If, after booking a ticket, you find that you can no longer attend, we would kindly ask you to cancel your booking through the Eventbrite registration page or by telephoning us (0141 353 5611) as soon as possible in order to give someone else a chance to attend.